Graham Goode Racing Introduce a New Range of Heat Wraps and Thermal Wraps From the USA....!! The first line of thermal protection for your engine compartment. Plain fiberglass tape provides only limited protection. Quality wraps have a special coating called vermiculite. This coating remains stable to 1500°F, provides 50% more thermal protection than plain fiberglass and provides improved abrasion resistance. The vermiculite coating asks like armor when heat strikes the fabric, causing the heat to travel across the fabric rather than through it, shielding the fiberglass from the heat source. We offer 2”x50’ plain and black and 1”x50’ plain and black. The first line of thermal protection for your engine compartment. Plain fiberglass tape provides only limited protection. Quality wraps have a special coating called vermiculite. This coating remains stable to 1500°F, provides 50% more thermal protection than plain fiberglass and provides improved abrasion resistance. The vermiculite coating acts like armor when heat strikes the fabric, causing the heat to travel across the fabric rather than through it, shielding the fiberglass from the heat source. We offer 2”x50’ plain and black and 1”x50’ plain and black. Manufactured from crushed lava rock filament fiber; this makes this header wrap strong and flexible while operating at its designed service temp of 1800ºF continuous and 2500º F intermittent of radiant heat. There is not a header or exhaust insulating wrap on the market today that will take temperatures higher and last longer. Volcano Wrap can withstand temperatures from extreme racing applications. With Volcano Wrap, your exhaust system will have a custom look of carbon fibre. 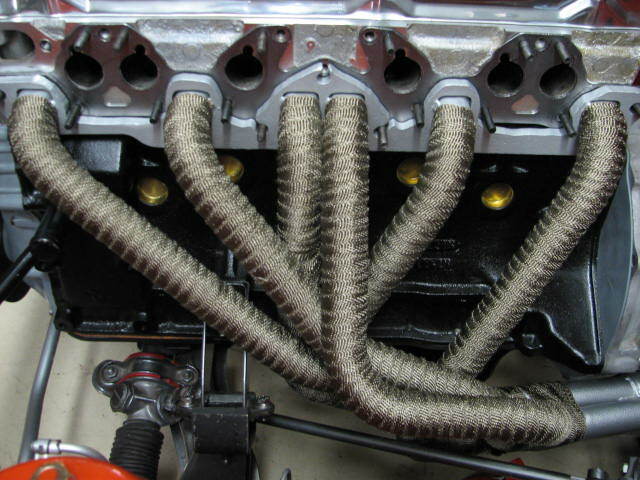 The SS Flat Ties are easiest method to secure exhaust wrap and other thermal shielding products on to your exhaust. The Ties come in 7.9” and 14” lengths. The friction retention method, used on these ties, has proven very successful in many years of use.